Lumbar spinal stenosis is narrowing of the spinal canal in the lumbar (lower back) region, or narrowing of the small tunnels (foramina) through which the spinal nerves pass. This can put pressure on the spinal cord and lead to a variety of symptoms. Spinal stenosis can be a serious condition as the proper functioning of the spinal cord may be effected. Congenital defect: Spinal stenosis can sometimes be caused by a defect that has been present in the spine since birth. It can sometimes take many years for symptoms to occur. Bone diseases: There are a number of bone diseases that can lead to spinal stenosis. These include Paget’s disease and achondroplasia. 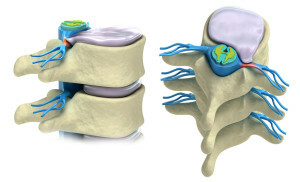 Disc herniation: A herniated disc can cause spinal stenosis either immediately or over time. Tumors: In rare cases, spinal stenosis is caused by the presence of a tumor in the spinal region. If you have been diagnosed with spinal stenosis you are likely to find that walking and standing aggravate your symptoms. Your symptoms may lessen if you lean forward or sit down. This is because standing/walking causes your spinal canal to narrow slightly, whilst leaning forward slightly opens the canal. You may have pain in your neck or down your arms; or in your back, buttocks, legs or feet. You may also have numbness or a tingling sensation (pins and needles) in these areas. You may have weakness in one or more limbs. In spinal stenosis it is possible for you to experience symptoms either on only one side, or both sides of your body at the same time. If you have a more serious form of the condition, you may have difficulty with bladder or bowel control. For most people, the first option for treatment is a conservative approach. Your doctor may refer you for physical therapy where you will receive treatment such as manual therapy, massage, heat treatment and other modalities to assist with managing your symptoms. The physical therapist will also provide you with education to help you live with your condition and be as active as possible and will prescribe exercises for you to perform at home. You may also be prescribed medication or be referred for a type of therapy called cognitive behavioral therapy. This type of therapy can be useful for people that experience chronic pain and can help you better understand your pain and live a full life. For a small group of people, surgery will become necessary. This is usually considered when pain has become disabling, when pressure on the spinal cord is causing weakness, if there are bladder or bowel symptoms, or if you are having problems with balance. There are a number of different types of surgery that may be considered for spinal stenosis and your surgeon will discuss with you the best approach for you and your condition. Although most people who have surgery have a good reduction of their symptoms, it is important to note that surgery may not always completely remove pain, especially if pain has been experienced for a long period of time before the surgery.